Apple’s new iPhone 8 is now on sale. Just like previous years, we have two models: iPhone 8 and iPhone 8 Plus. This year, Apple has used glass back, metal frame, and a fragile screen. So, you need to be extra protective because iPhone costs high. If you have just bought the new iPhone 8/iPhone 8 Plus or thinking to buy, you should also consider buying case or cover for it. Here is the list of best cases and covers for iPhone 8 or iPhone 8 Plus. Casetify offers Custom Cases and allows you to customize the case of your iPhone 8. You can upload your own images and choose the style before you order one for you. There are lots of options to choose. The cover offers good protection, easy grip. Few come with a leather card case, few allow you to put credit cards and there is a wallet case as well. This is the wooden cover for iPhone 8. It is handmade with protective black bumper shell and easy access to all ports. It looks nice, comes with slim design and aims to offer better protection. This is another beautiful case to give your phone a good look. The shell case is flexible and black rubber with ridged sections. It has tactile button covers and accurate cut-outs. There are several options to buy. You can get any design that suits you. If want a slim case for your iPhone 8, this one is good. It is stylish and comfortable. It has tough polycarbonate core wrapped in a cotton chambray fabric. It comes in black or gray color options. This is also a good case if you find iPhone slippery. 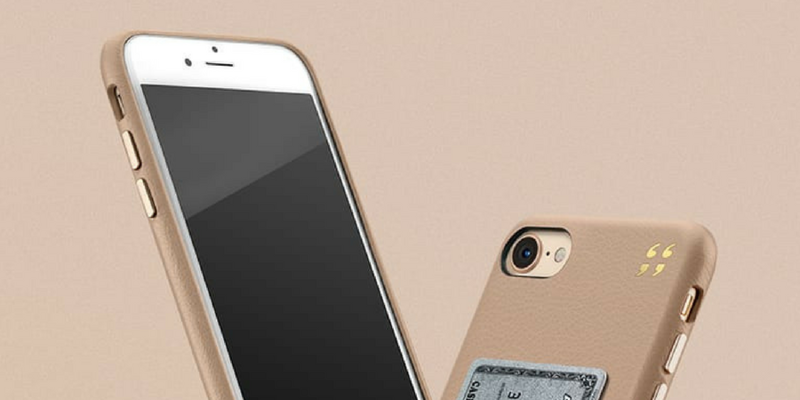 It is a slim case offering textured body. It is light with air pockets at corners to prevent drops and bumps. It is another good protection to keep your iPhone 8 safe. It has a scratch-resistant finish and raised bezels around the screen to keep your phone safe. It is also a good case with crystal clear or tinted polycarbonate back panel depending on your choice. You get several color options. The cut-outs are spot on. It also claims to offer military-grade drop protection to ensure your iPhone 8 isn’t damaged. It has an aluminum frame with a polycarbonate shell and a malleable rubber lining to absorb shocks. It offers good protection and can withstand drops onto concrete from up to 6.6 feet. Otterbox Defender is also a good case for iPhone 8 or other models. It comes in several color and design options. It claims Triple-layer defense: inner shell, outer cover and touchscreen protector. Not just this, it comes with limited lifetime warranty. This is another nice product to consider. It comes with Waterproof Full-body Rugged Case with a waterproof seal. It has durable drop protection.